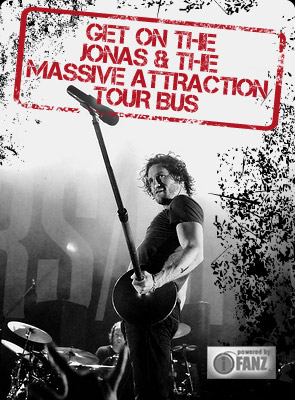 It’s been quite a year for Jonas & The Massive Attraction since the release of their debut album Big Slice, with a Top 10 hit single also entitled “Big Slice,” a Top 20 follow up single with their current #18 hit “Seize The Day,” and touring across the country with a variety of artists including Kid Rock, Seether, Hinder and My Darkest Days. The Montreal rockers are set to release their first video in over four years with “Seize The Day” scheduled to make its worldwide debut on October 13th, 2011. The long awaited video was shot and directed by acclaimed photographer Dominic Gouin and filmed in various locations in and around Montreal throughout the summer in between shows, as the band toured relentlessly from coast to coast.